Eli "Samuel" WARREN [Parents] was born on 25 Jul 1892 in Woodbury, Cannon, Tennessee. He died in Nov 1961 in Orlando, Orange, Florida. Eli married H. STINNETT in 1916. H. STINNETT [Parents] was born on 1 May 1896 in Justice Precinct 2, Ellis, Texas. She died on 27 Oct 1978 in New Smyrna Beach, Volusia, Florida. H. STINNETT married Eli "Samuel" WARREN in 1916. Dorothy Mabel WARREN was born on 19 Dec 1918 in Tulsa, Tulsa, Oklahoma. She died on 28 Sep 2001 in New Smyrna Beach, Volusia, Florida. Jack Blythe WARREN was born on 5 Apr 1921 in Tulsa, Tulsa, Oklahoma. He died on 2 Aug 1999 in , Geauga, Ohio. Bettie Eileen WARREN was born on 5 May 1925 in Orlando, Orange, Florida. She died on 15 Feb 2010 in Orlando, Orange, Florida. James Reed WARREN was born on 30 Jul 1927 in Orlando, Orange, Florida. He died on 24 Nov 1951 in , , North Korea. SHANNON. SHANNON married H. STINNETT. H. STINNETT [Parents] was born on 1 May 1896 in Justice Precinct 2, Ellis, Texas. She died on 27 Oct 1978 in New Smyrna Beach, Volusia, Florida. H. STINNETT married SHANNON. John STINNETT was born in Aug 1854 in Antoine, Pike, Arkansas. He died after 1900. John married Alabama STRAUGHN on 12 Jul 1874 in , Clark, Arkansas. Alabama STRAUGHN was born in Apr 1858 in , , Mississippi. She died after 1900 in Justice Precinct 2, Ellis, Texas. Alabama married John STINNETT on 12 Jul 1874 in , Clark, Arkansas. Carrie J. STINNETT was born in Aug 1877 in Amity, Clark, Arkansas. Laura A. STINNETT was born in Feb 1881 in Amity, Clark, Arkansas. Sadie STINNETT was born in Jun 1887 in Amity, Clark, Arkansas. She died after 1900. Edith STINNETT was born on 22 Mar 1889 in Amity, Clark, Arkansas. She died on 12 Jul 1935 in San Antonio, Bexar, Texas. Alma STINNETT was born in Aug 1892 in Amity, Clark, Arkansas. She died after 1900. Mabel Clare STINNETT was born in Feb 1894 in Justice Precinct 2, Ellis, Texas. She died in 1950 in , Orange, Florida. F vii H. STINNETT was born on 1 May 1896. She died on 27 Oct 1978. Hazel STINNETT was born on 1 May 1896 in Justice Precinct 2, Ellis, Texas. She died after 1900. Carle STINNETT was born in May 1899 in Justice Precinct 2, Ellis, Texas. He died after 1900. James P. FOSTER was born in May 1835 in , , Tennessee. James married Mary GREEN. Mary GREEN was born in 1839 in , , Tennessee. Mary married James P. FOSTER. Porter C. FOSTER was born about 1863 in , , Tennessee. F ii Alice Dean FOSTER was born in Jul 1865. She died in Aug 1947. James W. FOSTER was born in 1868. Eliza C. FOSTER was born about 1870 in , , Tennessee. Martha T. FOSTER was born about 1874 in , , Tennessee. James P. FOSTER was born in May 1835 in , , Tennessee. James married Tennesse FOSTER in 1879. Tennesse FOSTER was born in Jan 1852 in , , Tennessee. Tennesse married James P. FOSTER in 1879. Isaac FOSTER was born in Oct 1883 in , , Tennessee. Ida FOSTER was born in Apr 1885 in , , Tennessee. Medie FOSTER was born in Nov 1886 in , , Tennessee. Anda FOSTER was born in Sep 1888 in , , Tennessee. Mandie FOSTER was born in Jul 1891 in , , Tennessee. Jack FOSTER was born in Oct 1893 in , , Tennessee. David BUNTING "Sr" [Parents] was born in 1792 in , Somerset, Pennsylvania. He died in 1848 in , Montgomery, Tennessee. David married Mary "Polly" FARRIAR in 1813. Mary "Polly" FARRIAR [Parents] was born in 1792 in , , North Carolina. She died in 1848 in , Montgomery, Tennessee. Mary married David BUNTING "Sr" in 1813. F i Susan BUNTING was born about 1812. She died on 29 Jul 1880. Piety E. BUNTING was born about 1813 in , , Tennessee. F iii Margaret BUNTING was born in 1814. She died in 1890. William F. BUNTING was born about 1816 in , , Tennessee. F v Catherine V. BUNTING was born on 31 Jan 1817. She died on 24 Sep 1895. Nancy BUNTING was born in 1818 in , , Tennessee. M vii Thomas W. BUNTING was born in 1820. F viii Martha Jane BUNTING was born on 4 Sep 1822. She died on 20 Oct 1908. M ix Needham Bryant BUNTING was born on 23 Apr 1824. He died on 13 Oct 1892. M x Wiley James BUNTING was born in 1826. He died in 1870. James BUNTING [Parents] was born on 7 Jan 1763 in Darby, Delawae, Pennsylvania. He died on 5 Feb in Darby, Delawae, Pennsylvania. James married Levicy FARRIAR in 1780 in , , North Carolina. Levicy FARRIAR was born in 1755. She died in 1825 in , Montgomery, Tennessee. Levicy married James BUNTING in 1780 in , , North Carolina. M i David BUNTING "Sr" was born in 1792. He died in 1848. Moses GRIFFIN [Parents] was born on 22 Jun 1793 in , Glynn, Georgia. He died on 28 Jul 1858 in Little River, Bell, Texas. He was buried in Fort Griffin Cemetery, Little River, Bell, Texas. 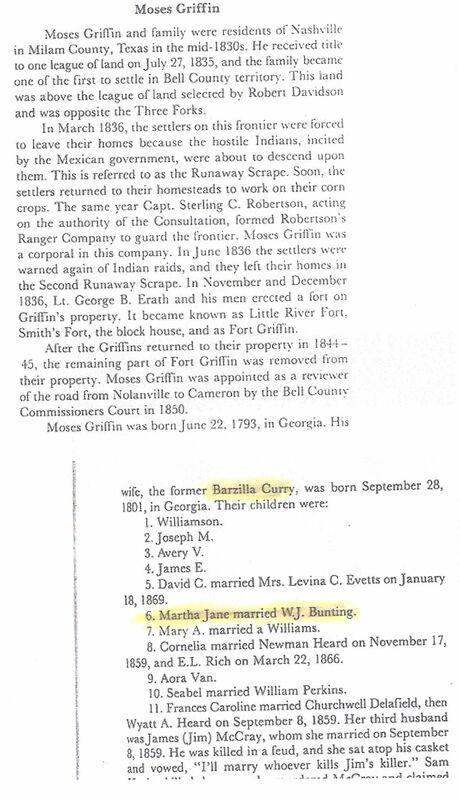 Moses married Barzilla CURRY in 1819 in , Washington, Alabama. Barzilla CURRY [Parents] was born on 28 Sep 1801 in , Lincoln, Georgia. She died on 22 Jun 1873 in Little River, Bell, Texas. She was buried in Fort Griffin Cemetery, Little River, Bell, Texas. Barzilla married Moses GRIFFIN in 1819 in , Washington, Alabama. William GRIFFIN was born on 30 Jul 1819 in , , Alabama. He died in 1819 in , Washington, Alabama. Thomas C. GRIFFIN was born on 13 Dec 1821 in , Washington, Alabama. He died in 1822. M iii Williamson GRIFFIN was born on 1 Dec 1823. He died in Sep 1855. F iv Mary Ann GRIFFIN was born on 16 Nov 1825. She died on 28 Jun 1869. M v John Jones GRIFFIN was born on 22 Oct 1827. He died about 1873. M vi Joseph Walker GRIFFIN was born on 11 Aug 1829. He died on 11 Jan 1873. Avery Vann GRIFFIN was born on 1 Jan 1831 in , Washington, Alabama. He died in 1831 or 11 Jan 1873 in , Washington, Alabama. James Edward GRIFFIN was born on 17 May 1833 in , Washington, Alabama. He died on 11 Jan 1873. M ix David Curry GRIFFIN was born on 3 Aug 1835. He died in 1915. F x Martha Jane GRIFFIN was born on 22 Apr 1837. She died on 8 Feb 1892. F xi Frances Caroline GRIFFIN was born on 18 Sep 1839. F xii Sibel Seabell GRIFFIN was born on 5 Oct 1841. She died on 4 Jul 1915. F xiii Cornelia GRIFFIN was born on 27 Sep 1843. She died on 25 Jan 1934. Solomon GRIFFIN [Parents] was born in 1777 in , Craven, North Carolina. He died on 20 Aug 1869 in Mt. Vernon, Pulaski, Kentucky. Solomon married Mary Margaret BULL in 1797 in , , Virginia. Mary Margaret BULL [Parents] was born on 21 May 1780 in , Dutchess, New York. She died in 1875 in , Rockcastle, Kentucky. Mary married Solomon GRIFFIN in 1797 in , , Virginia. M i Moses GRIFFIN was born on 22 Jun 1793. He died on 28 Jul 1858. F ii Catherine GRIFFIN was born on 5 Dec 1798. She died in 1863. Thamar "Tamar" GRIFFIN was born on 1 Mar 1803 in , , New York. She died on 10 Mar 1892 in , Rockcastle, Kentucky. M iv John GRIFFIN was born on 11 Jan 1805. He died in 1872. Isaiah GRIFFIN was born on 8 Jun 1807 in , Lincoln, Kentucky. F vi Anne GRIFFIN was born in 1809. She died in 1897. Esther GRIFFIN was born on 6 Mar 1812 in , Rockcastle, Kentucky. She died in 1901. Elizabeth GRIFFIN was born on 20 Jul 1814 in , Rockcastle, Kentucky. Joseph Nelson GRIFFIN was born on 16 Nov 1817 in , Rockcastle, Kentucky. He died on 24 Jul 1898 in Eubank, Pulaski, Kentucky. Adam GRIFFIN was born on 25 Jul 1822 in , Rockcastle, Kentucky. He died on 2 Mar 1878 in , Rockcastle, Kentucky. Nancy GRIFFIN was born on 25 Mar 1826 in , Rockcastle, Kentucky. Thomas B. CURRY "Sr" was born in 1771 in , , South Carolina. He died in 1841 in Wheelock, Robertson, Texas. Thomas married Satsa B. VANN in 1797 in , , Alabama. Satsa B. VANN [Parents] was born in 1774 in Spring Place, Murray, Georgia. She died in 1831 in , , Alabama. Satsa married Thomas B. CURRY "Sr" in 1797 in , , Alabama. M i Isaac PRITCHETT "Jr" was born on 15 Oct 1790. He died on 27 Oct 1875. F ii Barzilla CURRY was born on 28 Sep 1801. She died on 22 Jun 1873. F iii Mary CURRY was born about 1802. She died in 1825. Elizabeth CURRY was born in 1803 in , , Alabama. She died before 1910 in , Anderson, Texas. Wiley CURRY was born in 1804 in , , Alabama. He died on 21 Apr 1836 in , , Texas. John CURRY was born in 1806 in , , Georgia. He died in 1850 in Drew, , Arkansas. Avery Vann CURRY was born in 1808 in , , Alabama. He died in 1835. F viii Elizabeth CURRY was born in 1808. She died on 15 Sep 1870. F ix Lucretia CURRY was born in 1810. She died before 1870. M x David CURRY was born on 21 Feb 1812. He died in 1858.